The 4th Annual Fashion Rocks show went down yesterday in NYC kicking of NY Fashion Week!! This year there were TONS of performances and tons of celebs along the red carpet celebrating this tumultuous event in NYC! Remember Fashion Rocks airs tonight at 9CST! Jennifer Hudson looks slamming. Who's her stylist? 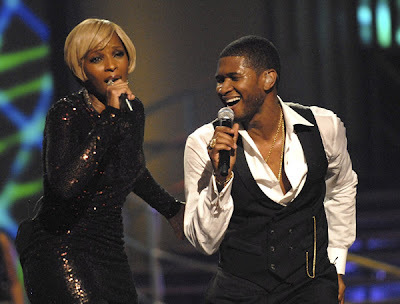 Does anyone know what song Mary and Usher performed? Are booties still in. I still see celebs wearing them? Jennifer still hasn't lost a lick of weight. Hudson doesnt need to lose any weight because she is pretty just the way she is. Jennifer needs to tone it up. She can still be a beautiful big girl but she's jiggly, or she needs soemone to dress her properly. What the hell was J.Lo doing, she needs to let singing go go go. Jennifer Lopezs new song irks me to no end. All of her songs have been samples of other people's songs. She is such a bore, *yawn*. I am new to the world of fashion blogging. I Love your site.Check out this spine tingling site. I saved 70% on designer wear. Awesome shopping! Hot cars included.